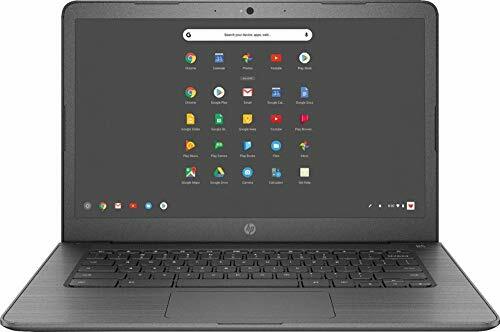 HP Chromebook: Conduct academic research with this 14-inch HP Chromebook. Its Intel Celeron processor and 4GB of DDR4 RAM let you run multiple browser tabs at once without performance lag, and the 32GB of flash storage provides quick access to files. This HP Chromebook lasts up to 10.75 hours on a single charge, so you can work untethered. Google Chrome OSAutomatically downloads and installs security and software updates, so you don't have to waste your time managing patches and waiting for restarts. 14" multitouch screenTypical 1366 x 768 HD resolution. Energy-efficient WLED backlight. Intel® Celeron® processor N3350Entry-level dual-core processor for general e-mail, Internet and productivity tasks. 4GB system memory for basic multitasking 32GB eMMC flash memory Built-in cloud support Intel® HD Graphics 500 Weighs 3.4 lbs. and measures 0.7" thinUltrathin and ultralight for maximum portability, featuring a smaller screen size and omitting the DVD/CD drive to achieve the compact form factor. 2-cell lithium-ion battery. Built-in media reader for simple photo transferSupports select memory card formats. Next-generation wireless connectivityConnects to your network or hotspots on all current Wi-Fi standards. Connect to a Wireless-AC router for speed nearly 3x faster than Wireless-N. Built-in HP TrueVision HD webcam with dual array microphone Built-in virus protection and Google products Headphone/microphone combo jack. Note: This Chromebook does not include a built-in DVD/CD drive.